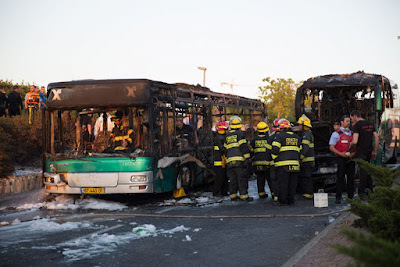 Unfortunatly Bus bombings returned to the streets of Jerusalem on Monday afternoon when a No. 12 passenger bus exploded and was engulfed in flames near the Talpiot industrial area. 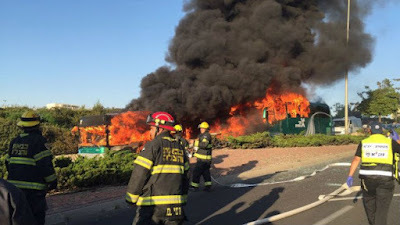 So fierce was the fire that a second nearby bus and a passing car also caught on fire. In all, 21 people were wounded, at least two of them seriously. Security forces on Monday evening were still hunting at least one suspect and urged the public to be vigilant. Prime Minister Benjamin Netanyahu vowed that those responsible for the attack would be brought to justice.